Stink, Judy Moody, and their family will entertain you with their antics during Hurricane Elmer. Your students will quickly make connections with many parts of the book. 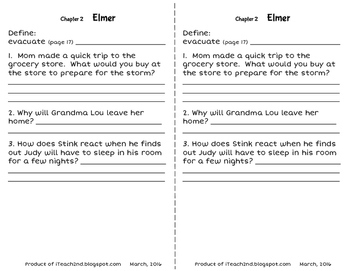 Your students will also learn many interesting facts and tips when they read Judy Moody & Stink The Big Bad Blackout. The product format is half page (my students LOVE the smaller booklet format). The half page packets can be easily tucked inside the book. 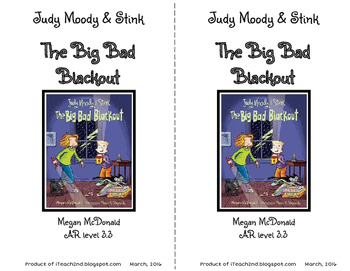 Judy Moody & Stink The Big Bad Blackout is an AR level 3.3 book. We hope your students enjoy this Megan McDonald book. Please leave your comments and feedback, we enjoy hearing from you. Also, we would love to have you follow us to receive notifications about our new TpT products, sales, and freebies.